"Decanter World Wine Awards" has rated the wine "Domaine Sigalas Santorini Barrel-Fermented Assyrtico, Aegean Islands, Greece" the vintage 2016 on 01.01.2017 with 95 of 100 points. "Wine & Spirits Magazine" has rated the wine "Domaine Sigalas Santorini Barrel-Fermented Assyrtico, Aegean Islands, Greece" the vintage 2015 on 01.08.2016 with 94 of 100 points. "Wine Enthusiast" has rated the wine "Domaine Sigalas Santorini Barrel-Fermented Assyrtico, Aegean Islands, Greece" the vintage 2014 on 08.01.2016 with 87 of 100 points. "Wine Spectator" has rated the wine "Domaine Sigalas Santorini Barrel-Fermented Assyrtico, Aegean Islands, Greece" the vintage 2014 on 15.11.2015 with 92 of 100 points. "Wine Spectator" has rated the wine "Domaine Sigalas Santorini Barrel-Fermented Assyrtico, Aegean Islands, Greece" the vintage 2013 on 30.09.2014 with 91 of 100 points. "Wine Enthusiast" has rated the wine "Domaine Sigalas Santorini Barrel-Fermented Assyrtico, Aegean Islands, Greece" the vintage 2013 on 09.01.2014 with 89 of 100 points. "Wine Spectator" has rated the wine "Domaine Sigalas Santorini Barrel-Fermented Assyrtico, Aegean Islands, Greece" the vintage 2010 on 31.10.2012 with 91 of 100 points. "Wine & Spirits Magazine" has rated the wine "Domaine Sigalas Santorini Barrel-Fermented Assyrtico, Aegean Islands, Greece" the vintage 2010 on 01.08.2012 with 92 of 100 points. "Wine Spectator" has rated the wine "Domaine Sigalas Santorini Barrel-Fermented Assyrtico, Aegean Islands, Greece" the vintage 2009 on 30.09.2011 with 90 of 100 points. "Wine Enthusiast" has rated the wine "Domaine Sigalas Santorini Barrel-Fermented Assyrtico, Aegean Islands, Greece" the vintage 2009 on 09.01.2011 with 90 of 100 points. "Wine Spectator" has rated the wine "Domaine Sigalas Santorini Barrel-Fermented Assyrtico, Aegean Islands, Greece" the vintage 2008 on 15.06.2010 with 90 of 100 points. "Wine & Spirits Magazine" has rated the wine "Domaine Sigalas Santorini Barrel-Fermented Assyrtico, Aegean Islands, Greece" the vintage 2007 on 01.10.2008 with 93 of 100 points. "Wine Spectator" has rated the wine "Domaine Sigalas Santorini Barrel-Fermented Assyrtico, Aegean Islands, Greece" the vintage 2006 on 31.10.2007 with 90 of 100 points. "Wine Spectator" has rated the wine "Domaine Sigalas Santorini Barrel-Fermented Assyrtico, Aegean Islands, Greece" the vintage 2004 on 30.11.2006 with 88 of 100 points. "CellarTracker" has rated the wine "Domaine Sigalas Santorini Barrel-Fermented Assyrtico, Aegean Islands, Greece" the vintage 2006 with 91 of 100 points. "CellarTracker" has rated the wine "Domaine Sigalas Santorini Barrel-Fermented Assyrtico, Aegean Islands, Greece" the vintage 2014 with 91 of 100 points. 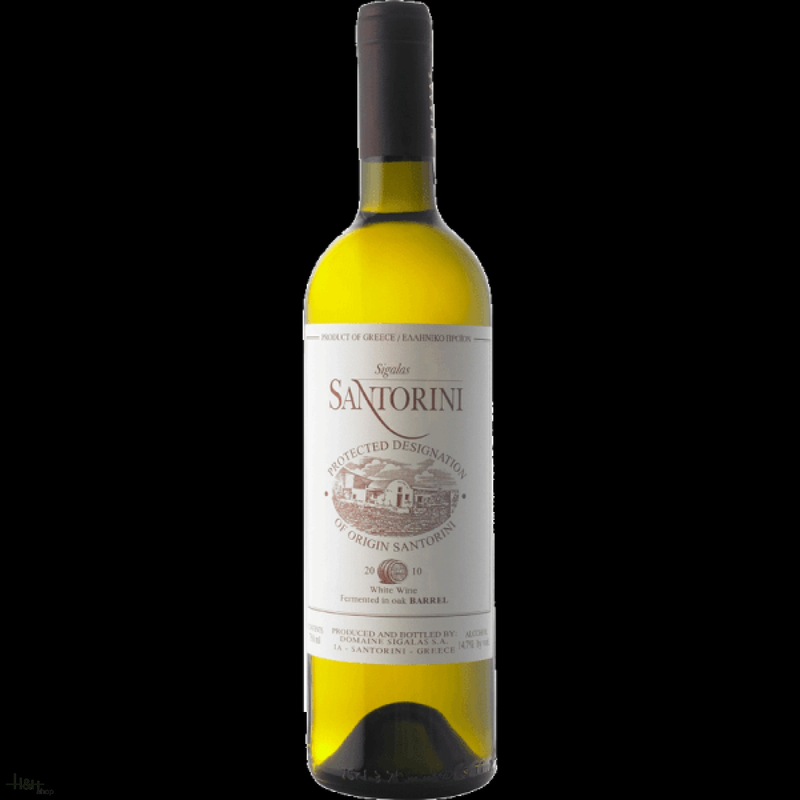 "CellarTracker" has rated the wine "Domaine Sigalas Santorini Barrel-Fermented Assyrtico, Aegean Islands, Greece" the vintage 2008 with 90 of 100 points. "CellarTracker" has rated the wine "Domaine Sigalas Santorini Barrel-Fermented Assyrtico, Aegean Islands, Greece" the vintage 2011 with 90 of 100 points. "CellarTracker" has rated the wine "Domaine Sigalas Santorini Barrel-Fermented Assyrtico, Aegean Islands, Greece" the vintage 2015 with 90 of 100 points. "CellarTracker" has rated the wine "Domaine Sigalas Santorini Barrel-Fermented Assyrtico, Aegean Islands, Greece" the vintage 2007 with 89 of 100 points.